The word "Arctic" comes from the Greek word for bear, arktos, after the constellations Ursa major and Ursa minor. Both are visible throughout the year in the northern night sky. The popular image of the Arctic is a treeless, remote wilderness with cold winters and cool summers occupying the northern reaches of the Earth. For many, the Arctic is a vast, frozen area around the North Pole, a harsh place of unforgiving and extreme conditions to which only a few species of plants, animals, and some indigenous peoples have adapted themselves, challenged constantly by cold and the seasonal variations of light and darkness. Geographically, the Arctic includes the Arctic Ocean, many islands and archipelagos, and the northern parts of the mainlands of the North American, Asian, and European continents. The largest Arctic land areas are in Russia, Canada, Greenland, Alaska, Fennoscandia, and Svalbard. However, there is considerable debate as to how the Arctic should be identified and defined and where its southern boundaries actually lie. Definitions of the Arctic boundary vary according to environmental, geographical, political, cultural, and scientific perspectives and biases. Confusion also arises because of the way "Arctic," "circumpolar North," "Northern regions," and "the North" are all used interchangeably. The Arctic as defined by temperature, and the Arctic marine boundary, also showing the boundary of the AMAP assessment area. about 66°33' N, which we know more commonly as the imaginary line called the Arctic or Polar Circle. This astronomical feature sets a definite and specific photoperiod for the Arctic and reduces the amount of solar heat absorbed by the Earth's surface, as well as providing the most recognized characteristics of the Arctic—long, cold, and dark winters, and short, cool summers with the midnight sun. Arctic and Subarctic floristic boundaries. of Canada, Greenland, and Alaska that lie several hundred miles south of the Arctic Circle. Similarly, there are many scientists who would disagree that all areas north of 60°N lie in the Arctic, arguing instead that some lands included in this definition, such as south ern Greenland and southern Alaska, are actually Subarctic. When the treeline is taken as the southern boundary, western Alaska, the Aleutians, and southern Iceland are said to be Arctic (though they would not be according to strict climatic definitions), although vast forested areas of northern Russia (which may have mean monthly temperatures below 10°C), where the transition from boreal forest to open tundra covers up to 300 km, would be Subarctic. Armstrong et al. (1978) consider Iceland to be the least "Arctic" country in their survey of the regions of the circumpolar North, on account of its position south of the Arctic Circle and its cold temperate oceanic climate caused by the North Atlantic drift. A common way of defining the Arctic is to do so climatically by using the 10°C summer isotherm (an area with an average annual temperature of 0°C and within which the mean annual temperature for the warmest summer month is at or below 10°C) as the boundary line. This boundary roughly corresponds with the treeline, but not with the Arctic Circle. Both the 10°C summer isotherm and the treeline, however, may diverge by as much as 100 km in some areas. Parts of western Alaska, the Aleutians, and southern Iceland are excluded from this climatic definition, even though they would be considered Arctic if the treeline is used as a defining boundary, yet both the 10°C summer isotherm and the treeline extend beyond 70° N in northern Norway and as far south as 55° N in Canada's Hudson Bay region. Sweden and Finland extend above the Arctic Circle, but these countries lie south of the treeline and the 10°C summer isotherm. The Arctic climate varies significantly by location and season and is in fact a collection of regional climates with different ecological and physical climatic characteristics. The mean annual temperatures vary greatly according to location, for example, from -12.2°C at Pt Barrow, Alaska (71.3° N) to -28.1°C at the summit of the Greenland ice sheet (about 71° N). Some of these differences are due to the poleward intrusion of warm ocean currents such as the Gulf Stream and the southward extension of cold air masses (Weller, 2000). The North Pole is not the coldest place in the Arctic because its climate is moderated by the ocean, and coastal settlements in West Greenland that are adjacent to the ice sheet typically have a mean temperature of -7°C because the climate is moderated by relatively warm ocean currents. Arctic lands span some 33° of latitude reaching 84° N in Greenland. The summer period progressively decreases from about three to two months from the southern boundary of the Arctic to the North, the mean July temperature decreases from 10-12°C to 2°C, and precipitation decreases from about 250 mm to as low as 45 mm per year. Because low precipitation characterizes the Arctic, large and elaborate river and lake systems are rare. North of the treeline the Arctic is characterized by the presence of permafrost, which is more or less continuous north of the forest tundra but becomes discontinuous to the south of the region. Permafrost restricts the downward drainage of melt-water from snow, and water accumulates on the surface as shallow lakes, ponds, and marshes. In general, the Arctic is arid and cold deserts dominate the High Arctic. The problem of how to define the Arctic and how to explain where Arctic regions are located becomes increasingly apparent when drawing boundaries for terrestrial and marine environments. In the terrestrial environment, many scientists would probably say that the southern boundary of the circumpolar Arctic is located at the northern extent of the closed boreal forests. 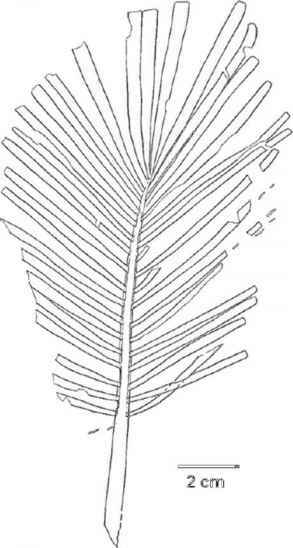 In reality, there is not a clear boundary but a transition from south to north consisting of the following sequence:- closed forest- forest with patches of tundra- tundra with patches of forest- tundra. This transition occurs over 300 km in flat areas but is compressed to hundreds of meters or less in mountainous areas of the Arctic. This transition zone stretches for more than 13,400 km around the lands of the Northern Hemisphere and is probably the Earth's most important environmental transition zone. The zone has been called forest tundra, lesotundra, Subarctic, and the tundra-taiga boundary or ecotone. Again, this definition of the Arctic does not correspond with the geographical location of the zone delimited by the Arctic Circle at 66°33' N latitude. Arctic lands are extensive beyond the northern limit of the tundra taiga-ecotone, where they amount to about 7,567,000 km2. They cover about 2,560,000 km2 of Russia and Scandinavia, 2,480,000 km2 in Canada, 2,167,000 km2 in Greenland and Iceland, and 360,000 km2 in Alaska. The complexity of defining the Arctic is amplified when the Arctic is divided into different zones. Although it is clear that the Arctic is not a homogeneous environment, definitions of Subarctic, Midarctic, and High Arctic environments conflict between different scientific traditions. In fact, there is a continuous gradient of environmental severity within the Arctic from the boreal forest zone at its southern boundary to the polar deserts of the far north, even if this is interrupted in some places by mountain chains and water bodies (Nuttall and Callaghan, 2000). The boundary of the Arctic marine environment is similarly difficult to delimit. An oceanographic definition is the meeting point of the relatively warm, salty water from the Atlantic and Pacific oceans and the colder, less salty water of the Arctic Ocean (CAFF, 2001). The Arctic Ocean receives important inflows of water from rivers and the Atlantic and Pacific oceans. 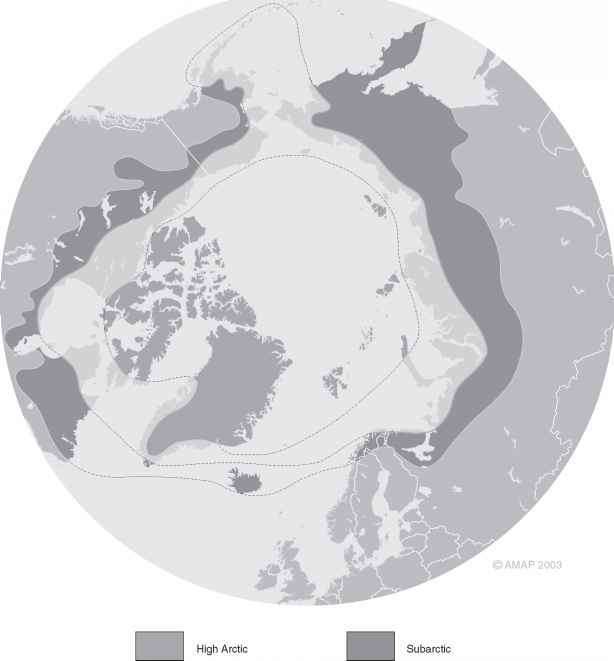 The total area of the Arctic marine environment comprises about 14 million km2, of which about 7 million represents the permanently ice-covered deep basins of the Arctic Ocean and most of the remaining 7 million km2 seasonally ice-covered areas. However, just as the boundary of the treeline varies greatly, so does the latitude of the ocean boundary, from about 63° N in the Canadian Archipelago to 80°N near Svalbard, with a Subarctic marine environment of mixed Arctic and Atlantic or Pacific water extending, in the case of the northern North Atlantic, from around 44°N off Newfoundland to 68°N off northern Norway (CAFF, 2001). Arctic marine regions may also be very cold, although they are usually less so than land areas. Cold waters in ocean currents that flow southward from the Arctic lower the temperatures in Greenland and the eastern Canadian Arctic, whereas the northward-flowing Gulf Stream warms the northern landmasses of Europe. This explains why polar bears and tundra are found at 51° N in eastern Canada and agriculture is practiced beyond 69°N in Norway. 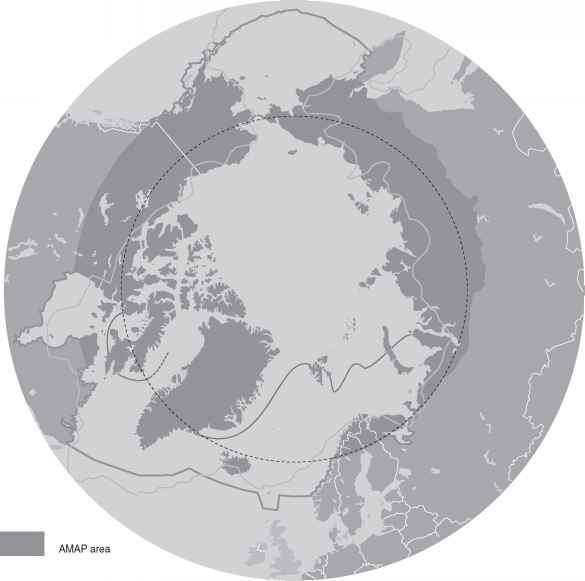 Such definitions of the Arctic are complicated further by attempts to draw geopolitical boundaries and to classify the regions of the circumpolar North as either political and economic peripheries or culture regions. Many Icelandic politicians and Arctic specialists would perhaps not agree with Armstrong et al. 's designation of their country as the least "Arctic" country in the circumpolar North, especially given Iceland's active leadership in Arctic affairs and chairmanship of the Arctic Council from 2002 to 2004. The various working groups and projects under the auspices of the Arctic Council have all defined the Arctic differently, reflecting various scientific, political, and cultural traditions in understanding where and what the Arctic is. For the purposes of the Arctic Council's Arctic Monitoring and Assessment Programme (AMAP), for example, the Arctic is defined approximately as the area north of 60° N in North America and Siberia, and north of the Arctic Circle (66.7°) in Europe, yet also including the Aleutian Islands, the Faroe Islands, Iceland, and southern Greenland. The boundary used by Conservation of Arctic Flora and Fauna (CAFF), another Arctic Council working group, differs slightly from AMAP's in that the Faroe Islands are not included. That the Arctic is not an area that can be clearly defined reflects the fact that the extent of the Arctic is entirely dependent on whatever definition is used. Furthermore, no one way of defining the Arctic is satisfactory for all purposes, and more often than not a practical definition becomes necessary in research projects, reports, assessments, and scientific monographs to determine what physical, ecological, political, and cultural processes are to be covered. For example, researchers using botanical definitions for research on Arctic vegetation calculate that Arctic lands comprise some 7.6 million km2, yet others calculate an area of only 4 million km2 (Nuttall and Callaghan, 2000). One important reason why it is difficult and perhaps inappropriate to define restrictive boundaries for the Arctic is because of its incredible variability, diversity, and connections with the rest of the globe. The Arctic is an important part of the global climate system and it both affects and is affected by global climate change (Weller, 2000), and the societies and economies of Arctic peoples are linked to the global economy and broader social and economic processes. Arctic ecosystems are linked to the ecosystems of warmer southern regions; Arctic air masses bring cold air to southern latitudes in the winter, but the winds from the south bring warmer air—and contaminants and pollutants— to northern regions. Migratory mammals, birds, and fish move to the Arctic in summer to feed and breed before returning south for the winter. Sea water cools as the currents bring it north and the cold fresh water from melting snow and ice add to the great ocean conveyer belt known as the thermohaline circulation, which has a significant impact on the global climate and sea conditions. Major rivers such as the Ob, Lena, Yenisey, and Mackenzie provide a substantial inflow of fresh water into Arctic waters, yet their headwaters are far to the south and provide a further connection between global and Arctic climates.